50% DISCOUNT ON ALL ITEMS! A funny slightly risqu revelation of a chosen card. After reading it out loud, the performer places the picture card back into the wallet before finally turning it over to show that the flasher has opened his raincoat to reveal the chosen card. It always gets a big laugh and looks magical as well. KIDSONIC is brand new, just for kids, and based on one of the best tricks ever: Supersonic. 5 giant full color cards are mixed and placed, backs-out, on an attractive hand held easel. 4 of the cards are grumpy old men, and one is a happy young child. Can the chosen kid pick out the happy, winning card? Yes! Every time! It's all under the magician's control and is as easy as easy can be. Use KIDSONIC for a fun rambunctious kiddy version of a Mentalist's Chair Prediction. No sleights, no 'forces', no sweat! A Birthday Bank-Night trick can get the Birthday Child the big prize every time, again with no sleights and no forces, just the 5 easy gaffed cards. Kidsonic also comes with a free second effect, a no smoking trick that you will perform, explain and give away to each child after the show. A Master sheet uses your home printer and snap-apart business cards to teach kids about staying smoke free. Kidsonic is also easily applicable to Safety Talks, Gospel Magic and is easy to apply to a myriad of other uses. Routines are included. Your KIDSONIC kit comes with 5 full color cartoon cards, a 6th card for the No-Smoking trick, a Master sheet for duplicating, a folding hand-held easel, adhesive numbers for optional use and fully illustrated instructions. You'll use KIDSONIC in a dozen ways. It's SUPER-sonic for kids and SUPER easy for you. This is a new model with a plastic handle and comes in two colors (red and black) and enables you to do the change with one hand. Also supplied along with the change bag is a fabulous book containing 101 tricks that you can do with this bag or other types of change bags. This Soft cover book, 5.5 inch x 8.5 inch size with 48 pages contains tricks that can be performed by beginners, amateurs or pro's, kid show performers or mentalists. Outer diameter 16 cm, inner diameter 10.5 cm, length 30.7 cm. A fantastic quick trick where a silk is trown on an empty frame and a dove appears. "So good, I wish I had thought of it myself." -Stewart James, after he saw the brilliant idea behind the many word tests that Sam Schwartz had created. 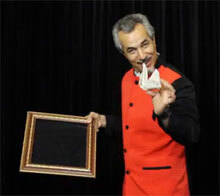 The performer shows a group of almost fifty word cards, one word to a card. The participant is handed all the cards and is asked to think of any one word. The performer proceeds to reveal the word without any hesitation, beginning with individual letters and then revealing the entire word! This can be done with your back turned, in a different room, over the phone, etc. and is suitable for both smaller and larger audiences. In addition to the clever method, Sam has refined the revelation procedure to look like you knew the word right from the beginning! The word cards are nicely printed on stock and laminated. You tell a story about doing a magic trick for your school teacher. To illustrate your story, you show a board with the word RED printed in white. Cover it with a silk, turn it around, and now the word is printed in red. Turn it around without covering it... and there is a picture of your teacher! Imagine sitting at a restaurant table with a group of people, saying, Before you decide it's impossible for words alone to influence your choices, consider why corporations spend 26 billion dollars a year in product and brand advertising. A friend in the ad business, John Shrell, agreed to share a few insider tips to show how it works, you continue, With the condition that he be allowed to verify my success. So when we finish, we'll have to make a phone call to satisfy him. He owes me lunch at (a local fine restaurant) if I show him I've learned enough. Here's his toll-free number. You write it on a paper napkin of a packet of Sweet'n'Low and toss it on the table in full view. Nearby items are quickly grouped in the center of the table - a salt shaker, a spoon, a glass, a packet of Equal, a napkin - the normal things found on most restaurant tables. Then you continue, All but one item will be eliminated in the fairest way possible. Here's how it's done, you explain, Everyone will take turns pulling two items slightly away from the others. One of them will be eliminated and the other will be returned to the center. But first, I'll attempt to influence your decision by using marketing terms. Just keep in mind, the final choice will always be yours. As each pair of items is selected, you describe them with advertising hyperbole and buzz words, You are deciding between a clean, shiny spoon and a sensible, conventional pepper shaker, or You're evaluating the fragile shaker full of sweet, delicious sugar and a sturdy cup for a man-sized serving of robust coffee. One by one the participants around the table cull the assortment of items until only one remains, for example, the napkin. I'm surprised, you admit, how dependable certain words are for influencing choices. But don't take my word for it, you continue, Let's call John to verify. Offer your cell phone to the person holding the number you wrote earlier. Go ahead, make the call. Let John know he owes me lunch. A voice mail message answers the call on John's line, he apologizes for being unavailable to take the call, and asks the caller to leave a 30-second message - especially if the caller is holding the thought of a napkin! No matter which item they choose, John names if specifically! This is not a P.A.T.E.O. force. We'd be ashamed to sell something like that for this price. Influence U is not any other kind of force, either. Period. It's a free selection. John Shrell will name ALMOST ANYTHING normally found on a table at the diner. For a single person (or when not actually at a restaurant) you could just as easily say, Imagine you've just sat down at a booth in a coffee shop. Let your eyes roam over the things on the table - does the glass have dried water spots on it? Are the fork's tines bent? Is the menu appetizing? Look at other things; the salt shaker, the teaspoon, the napkin... Now, imagine me reaching into your imagination and removing one of the things you've visualized. Which one did I take? This is a reputation maker! Borrow a spectator's ring and place it in your hand. With no suspicious moves, it Vanishes! Reach into your back pocket and take out an fancy black leather zippered key case. Inside the key case and Linked onto one of the Key Rings with your keys is THEIR RING! Great Quality Reel and Purse. The magician displays a silk handkerchief, shows his other hand empty and then stuffs the handkerchief into his closed fist. Reaching up into the air with his other hand he produces a salt shaker at his fingertips! Sprinkling a little salt over his closed fist, the silk is then shown to have vanished! The magician tears a selected card into small pieces, having the spectator hold onto one piece. He drops the pieces into a borrowed handkerchief gathered together by the corners forming a small bag. The magician sprinkles some magic salt into the bag and opens it to find the card completely restored except for the missing corner! The legendary gimmick from the 1950's is back! There is no better way to have a coin vanish or change places! Read the effect carefully - every word of it is true! Show a quarter and a borrowed penny, which can even be marked by a spectator. Place the penny in your jacket and the quarter on your palm. With a magical gesture, the quarter disappears in full fiew and the penny appears in its place! Both hands are otherwise empty! The quarter is now found in your jacket pocket! A spectator can immediately take the penny and will confirm that it's the one he marked before! NOTE: A ROUTINE WITH SEVERAL VARIATIONS OF VANISHES AND REAPPEARANCES IS DESCRIBED IN THE INSTRUCTION. THIS IS JUST ONE OF THE EFFECTS! Show a 50 Eurocent and a lend a 1-Euro coin, which can even be marked. Place the Euro in your jacket and the 50 Eurocent on your palm. With a magical gesture, the 50 Eurocent disappears in full view and the Euro appears in its place! Both hands are otherwise empty! The quarter is now found in your jacket pocket! A spectator can take the Euro from your palm and verify that it's his marked coin! You can make the coin vanish from your palm, from a tabletop etc! The change of the coins is absolutely fantastic! It will make your audience's eyes pop, whether they are lay persons or skilled magicians. Available with US-quarter or 50 Eurocent. A Visible Transformation with INSTANT Reset! Just as you approach your audience, you realize you're chewing gum. As you apologize for the social faux pas, you remove the gum from your mouth and search in vain for a place to put it. Since nothing is handy, you'll have to resort to magic! You wave the gum and it visibly transforms back into a new dry stick! Another magical pass and it's now completely wrapped! You can even give it out for inspection! X-ceptionally visual magic that will stun your audience! A selected card is lost in the deck. You remove a four of a kind from the deck which includes the selection. The faces of the cards are clearly shown as the card thought to be the selection is placed to one side. Employing the X-Factor you begin to verify the selection's identity by showing that the other three cards now have a big, black X emblazoned on their faces. The mind-blowing climax comes when the selection is turned over to show that it not only has a big X across its back but the back also changed color! The Magic Tricks sold on this site are not appropriate for children under age 5. Many of our Magic Tricks contain small parts that could choke someone if swallowed. Parental discretion is advised! It is your responsibility to choose Magic Tricks appropriate for your child. If you have any questions, please contact us before you buy. All prices are in US Dollar. Euro is shown for comparison. All weight units are metric. Maxello reserves the right to change prices for products at any time. The World of Magic Tricks at Your Fingertips!